I actually had a few Poshmark sales this month, namely a Coach bag and the resale of a J. Crew necklace I bought earlier this year. There was a buyer who wanted it more than I did, so I sold it and recouped my exact cost. Easy come, easy go! Overall, this month I got some things I really love (Gap and Old Navy were awesome) and I hardly spent anything when you factor in my sales and blog earnings. LANY Meow Meow Bag in Green ($65 w/shipping): When I saw the LANY cat bag that Kaelah got at WWDMAGIC, I knew I had to have one. I followed LANY on Instagram to wait for it to come out, then became completely flabbergasted when there were a bunch of color options! For a while I thought about the cobalt blue (I don't need black or brown) but settled on dark green because I thought I would wear it more. It's the same color Kaelah got, but I figured we could be twinsies! GapFit Train Racer Tank (originally $30, paid $13): I spotted this on sale for $20, plus the additional 40% off in store. I couldn't resist such a great deal on a workout top. Fabletics Outfit (FREE): See review of these pieces here. Old Navy Jersey Faux-Wrap Dresses in Coral & Cobalt (originally $30 ea, paid $13 ea): Wrap dresses are universally flattering it seems, and knowing I have a trip for work coming up in Florida, these felt perfect for warmer weather. They were $15ea and then 15% off sale items. Old Navy Halter-Neck Maxi (originally $47, paid $33): This dress was just beautiful, so I had to see if it worked on me. It's a dream. I wish I could buy more in similar styles without looking crazy. Old Navy Chambray Popover (originally$27, paid $14): Picked this top up when I was in store returning something. It was on sale, and perfect for the warmer weather. I liked the quality! Converse Chuck Taylor All Star in Red (originally $45, paid $35): I had a $10 DSW reward, and I wanted some comfy kicks for a trip to DisneyWorld. Instead of red Toms, I decided these would do. They're classics, after all. Forever 21 Top ($30, not pictured): Purchased a cream-colored top with long sleeves before my vacation/work trip. I'm always looking for top with sleeves because hotel conference rooms are cold. It was a bit impulsive, but it's a cute top! I would like to buy some cute vintage reproduction dresses for summer, as well as a couple of A-line or circle skirts as summer basics. I am also thinking about a pair of shoes from b.a.i.t. footwear. I am really loving vintage styles these days, something about the warmer weather. I also find I am much more picky about what I add to my closet. It has to be something I can wear to work, or something I will wear enough to make the purchase worthwhile. 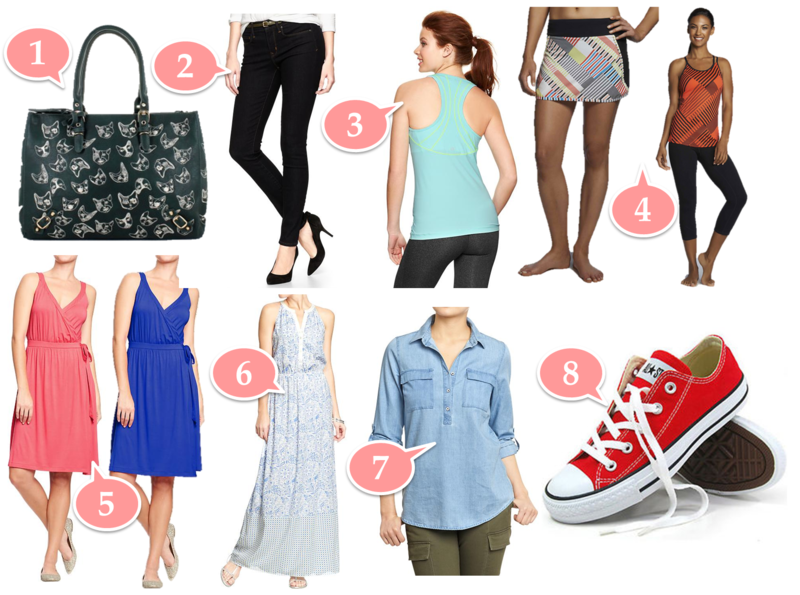 As always, linking up with Fran's budgeting bloggers... check out their hauls this month! ModCloth has some really cute dresses. I think everyone succumbed to old navy and gap this past month. I know I did! Chucks are great for Disney. :) Hope you're having a magical time! They have such good sales! And yes, I am having a magical time. Almost done with work, though some thunderstorms have literally been drenching Disney the past couple of days! I am definitely leaning more towards things I believe I will wear more. i do get inspiration from bloggers like you! For vintage looking dresses, I would definitely check out eShakti. Most of their stuff has a cute retro vibe (I think - with the colors and flared skirts)! And seriously, how adorable is that bag?!? I think I need one too! Nice workout gear! And I love the stuff you got from Old Navy The dresses will be really nice for summer! i really wish i didnt see that bag! i love it! i love both dresses you got, and that chambray is super classic. i want one like that, that doesnt button all the way. Oh my gosh, that cat bag is so incredibly cute! I've seen the storms! I'm glad you're surviving them! Love it all... but that kitty bag? Oh, I just die! Too adorable! It stinks because the pool time is limited, and it's hard to tell when it will stop or start. But that doesn't mean we aren't enjoying the magic! Great tip! The cat bag is just awesome. It's a steal for the price and quality. I wore both of the dresses this week during my trip to Disney World, and they were soooo comfy. I will probably wear them all summer until they're pilling. Very flattering too. I figured out why all my chambray shirt purchases didn't work before... I needed the popover version! This Old Navy one is so great I'm tempted to buy another in another color. Comes in 6 colors! Great quality too. I try to avoid coming off as a crazy cat lady, but this was too irresistible. I love it! It holds a laptop too.